This one’s for Tyson for reminding me that a blog needs to be fed. Photo: Sunday Japanese breakfast at home. Broiled aji hirakiboshi (split-open, lightly dried horse mackerel), rice, pickles, miso soup, genmai cha (green tea with roasted brown rice). 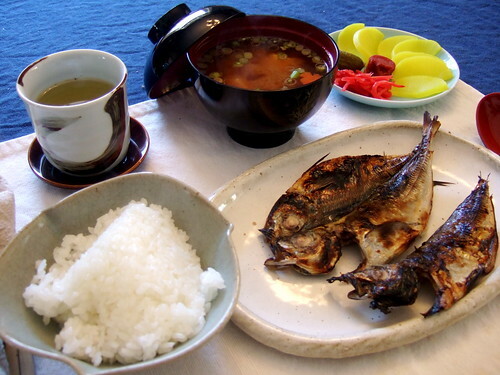 I woke up this morning craving a Japanese breakfast: miso soup, grilled fish, rice, pickles. I had been collecting all these Japanese products and we hadn’t been fully exhausting the pantry and freezer. Time to make the dashi. Delicious breakfast, and I had enough leftover rice to make a bunch of omusubi (rice balls, perhaps more commonly called onigiri). Leftover rice tip: Rice is much like bread, it keeps much better in the freezer than in the fridge. Of course, if you are making fried rice the next day and need dried out rice, the fridge works. But when I’ve made extra Japanese-style rice—sometimes koshi-hikari from California, uonuma from Niigata when I am jonesing for the supreme stuff—I make omusubi to freeze. When the rice is still warm, wet your hands, rub your palms with a little salt, and press the rice into thick triangles or round patties (or balls or cylinders, whatever). Wrap in plastic wrap and put in the freezer. When you want rice, you can grill/broil them. Put them in a green tea and dashi broth (to make ocha-zuke). Or eat them grilled and topped with a miso sauce, such as a walnut (kurumi) miso sauce (example at TasteofZen.com). You can also just steam them if you want plain rice. I got a little overexcited finding this wicked cool Japanese Web site with 100 regional onigiri/omusubi styles. Even if you can’t read Japanese, click on the text around the map to pull up some photos. There are also four categories (click on the the bars at the top of the map) that show: furosato (local style) onigiri, kōraku (sightseeing, picnic) onigiri (with examples for spring, summer, fall, and “late fall”), innovative onigiri for the 21st century, and kihon (basic, fundamental) onigiri. YUmmy…. I love fried tofu dredged in kudzu root starch found at Eden. Shout out to Madam. That looks deee-lish. I have used this photo in my blog, with credit to you and link to your blog. Please do let me know if you have any objection. If you do, I will take it off. Thanks!